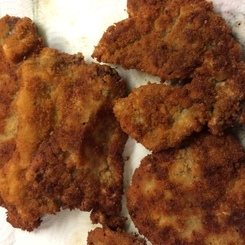 Since eating at Fischers's, I've been inclined to make Schnitzel. This is my attempt. Heat pan with a generous amount of oil. Dip into flour -> egg -> bread crumbs.